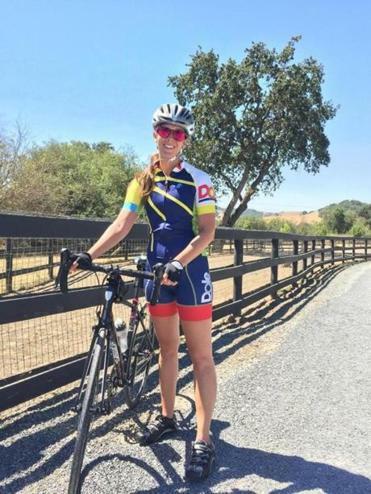 Jenn LaVardera cycled from Napa Valley to Monterey, Calif. Registered dietitian Jenn LaVardera has worked at Dole Food Company in Westlake Village, Calif., for two years, but still fondly recalls living in Boston while earning a master’s degree in nutrition from Tufts University in 2013. In fact, her work as a research assistant in various Massachusetts schools inspired her to select the Watertown Public Schools as her fund-raising beneficiary for a salad bar to provide students with more fresh fruit and vegetable options. From July 26 to 28, LaVardera cycled nearly 200 miles from Napa Valley to Monterey, Calif., raising $2,145 in the third annual Tour de Fresh benefiting Let’s Move Salad Bars to Schools. To date, the public health campaign, which Dole cosponsors, has provided more than 4,650 salad bars valued at $3,100 each to schools nationwide. After committing to the event, however, LaVardera realized she had a long road ahead of her. According to LaVardera, the 59 cyclists biked for approximately six hours each of the three days, including periodic rest stops. She joked that she was the only one who went faster uphill. For more information, visit tourdefresh.com.